We did not get to far today but we saw a lot. 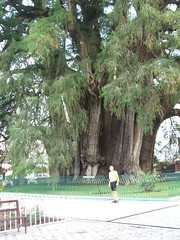 First we visited the hugest tree I ever saw “El Arbol del Tule” 54 meters circumference and 45 meters high. Second stop was the village of renowned weavings, Teotitlan. We stop by several shops and did get a couple of impressive demonstrations I saw a rug being woven for a doctor in Oaxaca which was huge, 9 feet by 20 feet and will take a month to weave at "Casa Santigago". I stopped by another old master weaver, Irene Jimenez Lazo and her family. Wonderful smaller rugs for around $70 dollars. If you get there her house and workshop is behind the main church. The church was built on an Aztec pyramid and some of the walls use the curved blocks from the old temple. We visited the artesian market next to the church. It is frustrating to see such wonderful craftsmanship and not be able to buy a thing. Both for me and the poor weaver. You can read about the weavers here. I bought a woven change purse for a dollar. Knowing that bicycle touring as a couple is full of compromises, I finally decided to compromise and do the big climb that Randy wanted to do. Popo (actually Popocatepetl) and Ixta (Iztaccíhuatl) are two of the three highest mountains in Mexico, at over 17,800 feet (5,400) meters, and the saddle between them is called the Paso de Cortes, and it's at 12,000 feet (3650 meters). Cortes came over this pass from Cholula (where we are tonight) to attack the Aztecs at Tenochtitlan (today's Mexico City). It's a direct route over the rim of the Valley of Mexico, but the 4,000 foot climb around a smoking volcano was a little threatening to us! During the next couple of weeks we visited three other colonial cities: San Miguel de Allende, Dolores Hidalgo and Queretaro all which have important connections to the Mexican War of Independence back in 1810. All the cities benefited from the silver mines; Wonderful churches and other colonial buildings were built as a result of gold and silver mining in the area over 250 years. The cities all were places that fought the Spanish for the right to govern themselves. 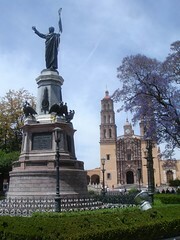 San Miguel has the most active interesting plaza. I sat in the plaza and painted well into the night. While drawing I listened to various musical bands serenading the people hanging around the plaza. 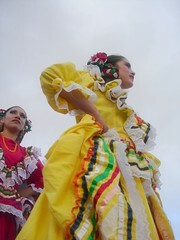 San Miguel has a large gringo population that has retired to this area and has influenced the culture of the area. As a result there is a huge library with wide selection of books in multiple languages, a very active art community and more old women beggars then any place else. 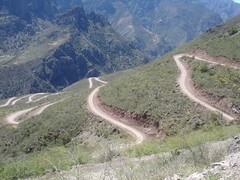 As we came in to Guanajuato, we were 5 kilometers (2 miles) above the center of center of town with million dollar view. We stopped at the first of many famous old churches. “Templo La Valenciana” A church built by a miner who promised if he made it rich he would build a church. The miner found the mother lode which produced 20% of the world silver plus gold, nickel and lead. As a result of his promise he built “Temple La Valenciana” which contains gold and silver ornated altars, carvings and giant paintings. 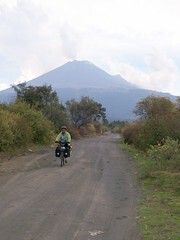 Here it was the end of March in Mexico and we had been riding for two months. The weather was great: no rain, the temperature was perfect somewhere in the seventies, sunny. All the things a bicycle tourist would want. 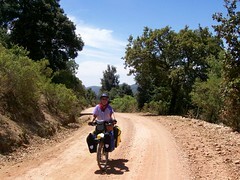 But the wind kicked up every day around 11:00, a couple of hours into our day and hearing traffic difficult to hear in windy conditions so we decided to take a quiet dirt road which someone had described as a beautiful ride and “a good training road”. Um.. sounded interesting. We headed down the road not knowing what it was going to be like but we did know it would get us to Guanajuato. It was a wonderful road with all the things we love. It wound its way up through a forested canyon on a good dirt road. There was so little traffic that we could let our minds wander or put on our head phones and rock to music as we rode. 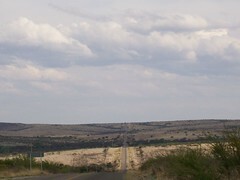 March 21, 2007 to April 7th Parral to Zacatecas Riding the high plains of northern Mexico was peaceful enough with arid high plains, scattered stunted dark colored trees like scrub oaks and what I thought was nut trees. The was little traffic and what traffic there was gave us lots of space and many waves and friendly beeps from their cars. The high plains were broken up with a few river valleys which we descended to find the area blooming with the newness of spring and planted with apple orchids, corn fields, and other cultivated fields. It turned out that the month of March is the windy season and we were greeted with varying strengths of winds through out this stretch in northern Mexico. 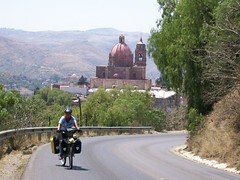 About 56 kilometers (35 miles) south Parral as we rode into the town of Las Nieves, the wind blew sheets of dust across the town, the roads and us. It was so impressive to see the wind blowing sideways full of the dust and particles of the arid landscape. We bought a few things to eat from the local Pemex gas station and continued on our way to find Poncho Villa’s Villa in Canutillo. The villa was a run-down complex with a handful of building with large photos and a bit of history about this Mexican who both was a local hero, a famous general of the Mexican revolution, and renegade (from the perspective of the U.S.). After the visit to the museum we decided to find a hotel because we both were sick with a cold and did not have the energy to continue. We found a clean economical room next to the bus stop which we laid low for two days recovering from our ailments. We headed out two days later feeling somewhat better. The winds where more gentle and the landscape was the same. Several nights we camped in the desert along this stretch along with what Randy calls the Mexican brown bears (cows). It was so nice to have such quietness in the vast dry landscape. It gives me a well needed break from the cities, the little pueblo with dogs that bark at us in the nights, the cars booming with music that have to pound the sense out of the youth that drive around in these moving music jukeboxes and the constant attempts to speak a new language I know so little of. The nights we camp I have come to treasure more then I knew. 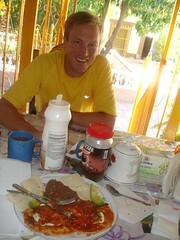 Randy enjoying a typical Mexicana breakfast: Instant coffee, Huevos Rancho a la Mexicana (Eggs with tomatoe, onion, peppers (the color of the Mexican flag is Red, white and Green) with tortillas and beans. We have decided this dish is an excellent meal to power us on our bike ride. (Protein, Fat, and carbohydrates). Tamales are another food we have discovered is an excellent biking food. The ribbon road down to Batopolis is one of the most amazing road engineering projects. The road twists its way down 5000 feet (1800 meters) through 5 ecosystems and millions of years of rock formations. If you look very closely at this photo you may see the foot paths and used by the Tarahumara (Raramuri) Indians to access the resources of this canyon and the way the people of this region travel to and from the outback. We hitched a ride down to the bottom with four Canadians driving this dusty, teeth rattling, back jarring road. It took around 5 hours to drive this 65k (40 mile) road. Around every corner was a new photo opportunity. We also hitched back with a kind couple from Mexico City who had hired a guide to bring them down and back up to creel. (Thank you folks for the ride and the time we had to share). The road was only really wide enough for one car so if another vehicle came around the corner, one of the drivers had to back up or down the road to a spot wide enough for both to squeeze by.